Tom Colicchio’s Heritage Steak was everything we thought it would be, and less. Calling it a copy of a copy is being kind. We anticipated Craftsteak-lite — a typical, Vegas, force-fed “concept” operation, direct from an absentee/celebrity chef to the gullible hoi polloi — with lots of nods to overdone/outdated culinary signposts (Vandouvan spices! bone marrow!) and barely enough execution by union cooks to justify the shameless tariffs imposed. To say it disappointed even on those terms is an understatement. To say that Colicchio and the corporate brains behind the idea haven’t had an original menu thought in a decade is probably closer to the truth. If Colicchio had tried serving this soup to Danny Meyer, he’d still be flipping burgers at Shake Shack. Lest you think such puffery was but a menu aberration, the advertised “apple slaw” was just a bunch of matchstick apple shreds. Just as absent was the barely-there, not-spicy-in-the-least-bit “spicy lime vinaigrette.” And what a few chunks of lobster were doing on this plate is anyone’s guess. The smart money says the overcooked, chewy crustacean is present to justify a $24 price tag for what used to be a piece of throwaway protein. Not content to gouge you with one hand, the restaurant takes away with the other as they don’t even bother serving the marrow with some toast or bread to spread the stuff on. If some contestant tried serving this on Top Chef, they’d be laughed out of the kitchen. They may be greasy and hell and sitting in (tasteless green) oil, but at least they had plenty of spice — although the raita had the consistency of thick mayonnaise, and not a hint of yogurt tang to it. From there, things devolved quickly. Again, no seasonings of note and none of the umami-rich additives (onions, mustard, Worcestershire, pepper etc.) that give a good tartare its zing. Impairing matters further was the pool of tasteless oil the meat was swimming in, “pickled beech mushrooms” that hardly were, and “bok choy kimchi” that might be the single biggest menu lie we’ve encountered since “homemade” started being used slick marketers — it being nothing more than a couple of raw leaves dabbed with chile oil. Adding insult to injury were the stale rounds of toast stuck on top of this hapless concoction. If Colicchio tried serving this to Batali or Ozersky, he’d be laughed out of the carnivore club. A steak so soft, puffy and denuded of its beefiness that we could’ve been munching on a piece of tofu for all our taste buds were telling us. It was a steak so bad that Colicchio should be banned from the steakhouse society….at least until he actually gets back in a kitchen and starts tasting the food with his name on it. Because selling this stuff based upon the way it tastes is never going to work. ELV’s above meal + a figgy pudding dessert that tasted a lot better than it looked + a single glass of warm red wine came to $179 (sans tip). Seems like MGM has really hit the bottom of the barrel. Between Heritage and the abysmal disaster that is Mina’s new 1842 pub you have to wonder who is steering the F&B ship over there. At least Crush is edible but that probably rests more upon Morton’s relatively unblemished track record (ignoring La Comida for a moment) than MGM’s seemingly dissipating ability to execute. There was a time when MGM rivaled even Wynn’s penchant for offering innovative and forward thinking dining options. Now? You have a piss poor replicas of replicas, tired nightclub operated rehashes and licensing deals that make Caesars Entertainment look like culinary masterminds. Someone should get whacked but instead they will probably just get promoted. Sigh. The strip is gravitating to mediocrity, but this place jumped straight to the bottom. Most disappointing meal of 2013. I agree with everything said here…these big name chefs just want to collect their huge paychecks and dont really give a f**k how they get i.e. the customer…well all should be as chef Robuchon and visit your places 4-5 times a year and actually taste the food, and have qualified chefs running your kitchens, not ex buffet chefs who fail health inspections…oh yes go see Mr. Colicchios other restaurants last health inspection…about as good as the food…..
Yup. Tasteless yet very tender steak and octopus charred so bad it was unedibly bitter. Soggy fried oysters and generic bbq pork belly. The creamless corn was fine, nothing to brag about. Never again. This is a situation (like Top Chef) where the food in the pictures sell the dish. If you didn’t tell me that the food was devoid of flavor I would totally be there buying up the Marrow, Tartare and Steak dishes. Thanks again for allowing your pallet to save mine. How could this be the best new restaurant for 2013?? CraftSteak here in CT (Foxwoods) closed or is closing soon. Awesome and so SPOT ON JONNY!! Thanks for calling out these jokes of restaurants. I literally ate everything you did when I went and couldn’t agree more SOOO BORING AND TASTLESS!! SUCH A RIP!! I first went to Craft when he opened in Beverly Hills when I live in LA that was a total joke too. He always talks about simple ingredients etc. He is serious for sure , all his food is simply flavorless! best most spot on review of the year!! so far. What space did this take over? I thought that the Mirage had a steak place that was just a few years old. It’s never a good sign when the best food writing is about the worst restaurants……………. What are freakin pickles doing with lamb! This is in the space that once was Kokomos. 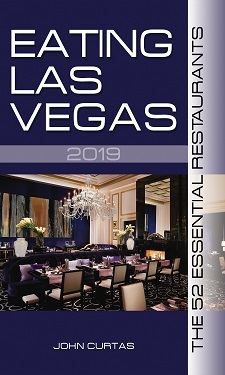 A few years back in the culinary heyday, the top Casinos on the strip had the best restaurants and as one went down the pecking order of resorts so did the quality of the food. This fact used to frustrate me when there on business, not at my resort of choice, and stuck eating at a midlevel steakhouse on the strip knowing that minutes away is another turning out amazing food. Quality of food seems to have gone down at all levels while prices have gone up at the top. I know that at one time Mirage was the Grand Dam of the strip but those days are long gone. Heritage looks like a lobby cocktail lounge in a resort that now looks like a Hawaii Ramada Inn circa 1984. Im certainly not surprised the food is average at best. Those who want better can walk to top places across the street but Mirage knows they wont which is why it is what it is. I could not disagree more. The food was immaculate and the service was great. If someone thinks the food was immaculate, they likely think Outback is gourmet. Craft at MGM has also gone downhill. John, your review is right on the money. I rather enjoyed my meal there when I went on opening week. Are my senses not as finely attuned as I think, or did the place go downhill that quickly? OMG I got dragged here last night for a business meeting for a conference that is being held at the Mirage. 6 people, check with tip came to $1000 and was one of the worst steak experiences in years. Slow service, bread and butter right away and then 1/2 hour to get drinks and to order apps. Had quail, octopus and lamb apps. Decent but all way too salty. But the steak….temperature perfect but the taste. HTF can they prepare a bone in ribeye that is almost completely devoid or flavor. Mushy and tasteless. 3 filets at our table. One that did not get delivered with the other 5 meals, they forgot!!! Again under seasoned and tasteless. One person had braised shortribs again lacking that beefy taste. WTF are they doing, boiling these things first? One of the guys said after that they can remember having a better tasting steak at Sizzler. John you nailed it.